Ministry is about life in Christ which aﬀects everything we do. Come and experience an expression of visual arts in photography projected as the choir, accompanied by guitar, strings, and piano, sings poetry by W.B. Yeats ‐ The Lake Isle of Innisfree. sardis.org. We hope to see you there! Friendship Connection, a fellowship group for retirees, will meet on Tuesday, April 16. The 11:00 a.m. program will be led by Dr. Jim Sasser. Dr. Sasser, a retired professor of history at Central Piedmont Community College, was with us in January and presented the program “North Carolina: Why We Are the Way We Are.” His April program will be “James K. Polk: Man of Commitment.” Lunch ($10) will follow at noon and reservations are needed for lunch. Make your reservation online at www.sardis.org or call the reservation line: 704.926.1590. Nominating Committee is seeking suggestions from the congregation for nominees to serve as Elders or Deacons. Please prayerfully consider submitting a name for consideration for a particular ministry. You may submit nominations at the worship services on Sundays or online at www.sardis.org. The nomination deadline is April 28. Americans today. The Congregational Life & Care Ministry invites you to join a panel of doctors and healthcare experts for a showing of the FIX IT film and a panel Q&A. RSVP to Pressly Gilbert at presslygilbert@gmail.com. As a Sunday school teacher for 20+ years I am often asked, why do you teach high schoolers? Jokingly parents will state that they struggle with their own teenagers and are not sure they are ready to face a broader group of teens. I too have felt this way in other areas of service at Sardis, and have found comfort that we raised our children in a strong community, a congregation that includes a broad range of talents. The church has always been there to support our family through childrenʹs programs, music, Logos, fellowship, Confirmation Partners, youth mission trips, choirs, recreation, and occasional events to help us as parents better understand the challenges that our youth have faced and continue to face. I am fortunate to be part of a team of teachers; itʹs another example of the community of Sardis. So, why do I teach the high school class? Because they teach me. I work to prepare for Sundayʹs lessons, I outline key points and consider various discussion scenarios. Then on any given Sunday, the youth take over. Yes, we start with a story, seek insights from scripture, but then something happens. The Sardis commitments of time, talents, and treasures invested during the transformational years for these youth start to show, they begin to lead the discussion and I simply moderate... and sometimes just observe... in complete amazement. I am thankful for those individuals who have (and who will) take time to reach out to our youth, volunteer, or support behind the scenes. I am thankful for those who give and pledge so that we can better plan resources. I am also thankful for those members that attend church regularly, demonstrating for our children the importance of community worship. Trust me, they notice. Thank you for sharing your gifts. Together, we are Equipping Sardis for Godʹs Mission. has fed the bodies and spirits of Sardis members and friends. Make a monetary donation! It costs $75 to make a recipe of 30 quarts. Help cook! We are always in need of those to help cook the soup. Contact Barbara Lansche at 704.975.1941, or visit sardis.org to find out more. Stephen Ministry Has Returned to Sardis! On February 24 we re‐commissioned Stephen Ministers who previously received 50 hours of training and served as confidential, one‐on‐one caring listeners at Sardis. Returning to service are: Debbie Coﬃeld, Sam Coleman, Carolyn Eichenbrenner, Rob Frazer, Alma Jo Langston, Barbara Lansche, Joyce Long, Jerry Reed, Anne Shoaf, Christa Sumwalt, and George Zalaquett. Stephen Ministers provide caring, confidential care for people going through diﬃcult transition in life. If you would like to know more about Stephen Ministry or if you would like to receive care from a Stephen Minister, contact Jane Fobel, 704.366.1854 or jane.fobel@sardis.org. 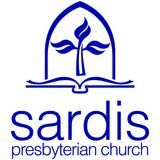 Session Highlights can be found at www.sardis.org under the News & Events tab. Republic of the Congo, Haiti/Dominican Republic, Israel/Palestine, and Peru through Presbyterian World Mission. peacemaking, advocacy, community development, and other important ministries. they are doing at www.sardis.org/Serve/Reaching‐Out. or praise regarding their work. Please keep each of these mission workers, and their work, in your prayers. 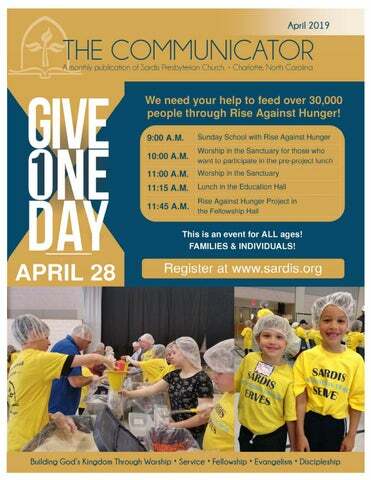 8:00 a.m. ‐ 12:30 p.m.
Sign‐up to donate or volunteer at www.sardis.org. go! If you have any questions, contact Brenda McKay (brendamckay58@yahoo.com) or Pressly Gilbert (pressly@presslygilbert.com). On Sunday, March 3, we were privileged to hear the inspiring story of Eugene Coleman and his journey from 20 years of homelessness to sobriety and a stable home. He had the help of many angels—a doctor, a woman with a message from God, and Kathy Izard at Urban Ministry who secured a home for him. In addition, Scott Mercer, a Stephen Minister, became Coleman’s sponsor and they currently market a BBQ sauce, with the proceeds to aid the homeless. “…set an example for the believers…” 1 Timothy 4:12. Forty‐one diﬀerent youth helped lead worship on Sunday, March 3 for our annual Youth Sunday! Six speakers shared their stories and related them to the Transfiguration of Jesus. If you would like a copy of the DVD from either the 9:00 or 11:00 worship services, please speak with Danelle Kime in the front oﬃce (704.366.1854). Twenty‐eight people attended the Middle School Beach Retreat on March 22‐24, 2019. During their time together, they examined their lives to see what image they were portraying to everyone around them. Looking at company logos, we talked about what the company was trying to tell us about their products. Then we applied the same lens to our lives: how are we showing our faith through our life and actions. The weather was great, if a little cooler than we had hoped, but everyone had a great time! Special thanks to Wendy Beauchemin, Brady Koesel, Heather Odean, and Robert Vanderford for going! Join us for Middle School Sunday School! What a great class of sixth and seventh graders! We meet each Sunday morning from 10:00‐10:45 a.m. in the Middle School room (Room 106). These young attorneys have debated across the aisles of retaining/removing the Magi verses in the Gospel of Matthew and have discussed creation vs. evolution. Come to see us each Sunday morning. There is a fun activity/story awaiting you as we travel through our enjoyable journey of faith, which includes snacks each Sunday morning! Summer Trips and Conferences It is time to register for the summer trips and conferences. Please visit our website (www.sardis.org/ministries/ youth) to register for any of our four major trips. Space is limited, so please reserve your spot today! “Let the little children come unto me.” Goodbye, Heather! With gratitude for her 13 years of service to Sardis Presbyterian, we want to share with you that Heather Eddy’s last day was Sunday, March 10. She served many areas of the church, and her duties will be assumed by other staﬀ members. For children’s ministry and nursery related items, please contact Katie Harrington (until we have our new full‐time Director of Children’s Ministry). Robin Medlock will be taking care of reservations, and Mark Slimer will be handling food and supplies. We give thanks to God for Heather’s time at Sardis. our nursery while preschool parents attend worship and Sunday School. You don’t have to commit to a regular schedule! Choose your days! Volunteers can be younger than 18 as long as there are two adults with them. Ready to volunteer? Sign‐up with our SignUp Genius found at www.sardis.org/ministries/children/. July 29 ‐ August 2 Register for both at www.sardis.org! Enroll Your Kids at Sardis Weekday School! The Sardis Weekday School has limited space for the 2019‐2020 school year, so don’t hesitate to reserve your spot. Are you looking for a half‐day preschool program for your child? The Sardis Weekday School oﬀers a program for children ages 1‐5 from 9 a.m. ‐ 1 p.m. We have a variety of class oﬀerings from 2‐5 days a week. Did you know that we oﬀer a Transitional Kindergarten program for students who will not meet the kindergarten cutoﬀ date or who need a bridge year to reinforce their skill set? Our program oﬀers a curriculum of hands‐on learning through exploration and sensory experiences while enhancing the building blocks of learning. We also oﬀer weekly and bi‐weekly music with our music and movement teacher, Spanish with our Spanish teacher, and our storyteller who visits us monthly. We have many special guests who stop by to oﬀer educational aspects such as dentists, librarians, and community helpers (police oﬃcers). If you are interested in enrolling we would be happy to give you a tour of our program. You can visit our website, www.sardisweekdayschool.org, contact us directly at 704.366.9681, or email our director, Elizabeth Angerson at elizabeth.angerson@sardis.org.